Taskbar Preview Thumbnails are those annoying huge windows that popup over your document when your mouse pointer drifts over the taskbar while you're trying to work. If they annoy you as much as they annoy me, here's how to get rid of them. 1. In Control Panel, click on the System and Security group. 2. On the System and Security page, click on the System group. 3. On the System page, in the left pane, click on the Advanced System Settings link. 4. In the System Properties dialog box that appears, on the Advanced tab, in the Performance section, click on the [Settings...] button. 5. In the Performance Options dialog box that appears, set the () Custom: radio button, then uncheck the  Enable desktop composition checkbox. 6. Click on the [Apply] button. Click on the [OK] button. Now the annoying huge popup windows are gone, only a popup list remains. If you want to make the Taskbar icons for an application appear separately instead of in a pile, Go to Control Panel's Appearance and Personalization group and click on the Taskbar and Start Menu link. 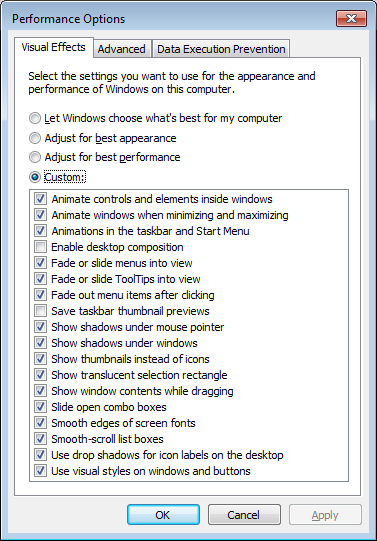 In the Taskbar and Start Menu properties dialog box that appears, in the Taskbar buttons: drop-down-list, select Never combine.